I bought a shock collar three years ago. It sat in my closet unused until three weeks ago. Why did an enlightened, educated, dog-loving person like myself by a “horrible device” like a shock collar? 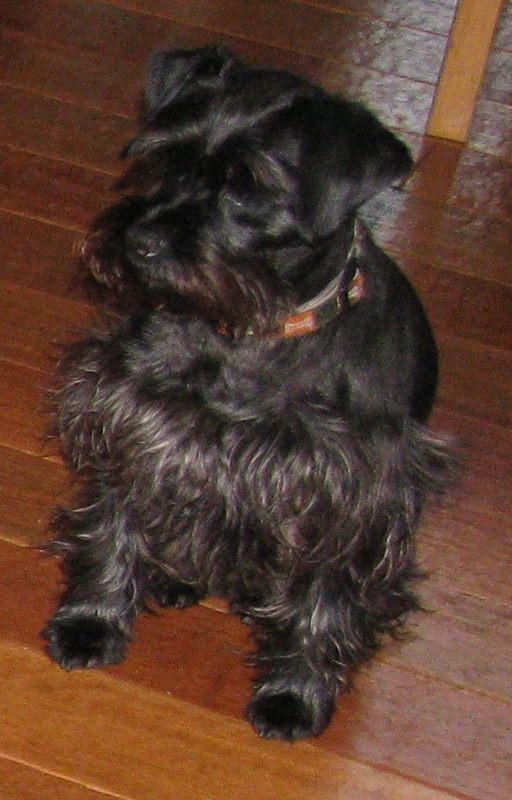 Ludwig is a black Miniature Schnauzer we adopted from the shelter five years ago to be our then-seven-year-old daughter’s companion. Back in my old days of pure off-leash walks, Ludwig had a problem with chasing deer. Ludwig’s terrier love of hunting drove his habit of ranging several hundred feet in front of me when we’d hike, and then I wouldn’t see him around a corner – suddenly I’d hear his excited “ON THE TRAIL” yipping slanting up the hillside. He was utterly unable to respond to my calls to come, even though in normal situations he had a wonderful “come-when-called” response. One horrible day, he took off and when I heard that yipping, I realized my very obedient young Lab mix “Levi” had run with him. Levi never had any interest in deer, but he couldn’t resist Ludwig’s enthusiasm. Both of them were too focused and too far to hear my calls by the time I realized what had happened. They were gone for four hours…the horror of thinking I’d lost two beloved family members in one day pushed me to buy the “e-collar”. I’d trained Ludwig to “Come”, like all my other dogs, but his response was utterly uncontrollable when he was hot on a deer trail. Miraculously, when I started “leadership walking” with my dogs, he quit looking for deer. I believe he felt more connected to the “pack”, and wasn’t constantly searching for deer trails – he was content to hang out with me and the other dogs during our off-leash play time. Unfortunately, Ludwig had another problem area that proved impossible for me to solve with my normal training: When he spotted a dog approaching or walking by, he would run to it utterly heedless of my calling him. Although his deer-chasing behavior was scary and frustrating, this dog-rushing behavior was dangerous! Ludwig is only 15 pounds, and seems utterly clueless to dog signals of aggression. He has had a couple of close calls with large, vicious dogs over the years because I could not call him back to me when he got focused. 1. Put the collar on when we get ready to get into the car, to connect the collar with the happy moment of going for a walk. 2. Sound the reward tone and pair with a tidbit of cheese or meat, so I can pair the collar with reward both close and at a distance, for the first week. 3. Condition him to run immediately to me when he feels a correction “nick” from the collar, so he doesn’t panic and feel confused. 4. Start with easy distractions first, like a bit of old garbage, or a spot he rolled in last week. Sequence: “Ludwig Here! [he ignores -“nick”-] Ludwig here!” Reward when he arrives. 5. Use the “nick” correction just like a leash correction. 6. Continue to practice on low-level distractions: kids running down road, or the neighbor in her driveway. 7. Expose him to dogs we know as distractions –dogs we know are safe, in case we fail. 8. Finally, practice and be ready for the real thing: when we’re playing off-leash and a strange dog shows up somewhere in Ludwig’s line of vision. 1. It is far to easy to hurt and/or scare your dog. With the level of ignorance, impatience and/or anger I have seen in the majority of the pet dog-owning population, it really frightens me to think of the average pet owner with this tool. Because of the ease of pushing a button, it’s very tempting to push it, “just in case”, or to get the level wrong accidentally and really freak the dog out, or to use excessive corrections out of anger, or to not have the right timing and correct the dog at the wrong moment, or not stop correction at the right moment. It’s a very precision instrument. Of course, people can scare and hurt their dogs in a lot of other ways too…it’s just too easy with the e-collar. 3. Using the e-collar when the owner isn’t knowledgeable enough to know the true cause of the dog’s behavior can cause some nasty consequences. For example, sometimes people want to solve “aggression” with an e-collar. They don’t know why their dog is aggressive, they just want it to stop. Aggression has many, many causes, and needs a more intelligent solution that gets into the dog’s psyche to unravel the puzzle. An e-collar is a very simple tool, like a leash that you “pop” to give a negative stimulus. When you push that button, you had better be very, very sure that you know what or whom the dog is going to blame the punishment on. If he’s staring down the neighbor’s Shepherd, you don’t want him thinking it was the Shepherd who just nipped his neck! 4. On my model, the hand-held unit doesn’t have a constant reading of what level you’re on – I have to push a button to see it. I constantly check it so I know it’s at the right setting. I nicked Ludwig at a too-high setting once, and he jumped completely off of the ground. On the other hand, if he suddenly takes off at high speed, I need a higher setting than normal fast, and to waste time checking the level when he’s moving into danger at high speed isn’t a good thing. With a dog who has problems listening at a distance, the e-collar can be a lifesaver. I’m kicking myself for not using this tool earlier with Ludwig. I cannot emphasize enough how crucial proper pre-training is though. Read the manual, watch the DVD the tool comes with, and/or contact a professional for help!